Three miles off the French coast, in the Stygian blackness of the Atlantic, lay the secret headquarters of OceanProject, a multi-billion dollar robotics company founded by the coding genius known only as Jedi. In hopes of gaining an interview – and a selfie – I’d infiltrated a dark, twisting underwater passage, which led straight to the building’s repair room. It was here that I discovered the androids – thousands upon thousands of mechanical mercenaries lined up like statues in the tenebrous darkness, stretching as far as my light would dare reach. All was silent… until a hand gripped my shoulder and dragged me into the security office. Fortunately, Jedi was there, and he’d decided to accept my interview. “Salut”, he said. Hello xat Jedi, thank you for welcoming me here. You are my newest interviewee! What’s your real name, how old are you, where are you living and where are you working now? My real name is Guillaume, I’m 23 years old, living in Annecy near Geneva. I’m a developer for a web agency. What words would you chose if you had to define yourself? For how long have you been on xat and how did you discover it? I’m on xat since 2009, I discovered it via Hetoan2‘s chat. He had a website about Wii hacking. I was in a Call of Duty team on Wii, we also had a forum and we added a xat chat to it, that’s how I started to use xat everyday. Well, for me it was just a faster way to speak with my teammates, no one was registered on xat, we liked the moderation system, and free smilies like smirk were cool. 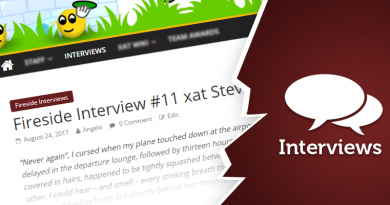 How did you get involved in the official chats of xat? I used to visit Aide weekly, then I started to help users… It was complicated to get a rank because one of the main owners didn’t like me, but I continued and I finally got member. What is your global impression of xat now? xat changed a lot, it’s normal because of turn over, new features… Every old users says “It was better before”. I would say, yes and no, it was better before because it was the website we knew and we wanted to keep it this way, but it’s wrong. When Admin introduced Bootstrap into their website, it was a very big and good change, when they started auction system, it was a good thing too (maybe it’s not the case anymore because there are too many ids), a random 7 digits cost 200k+ and 200k was a big amount of xats. When they allowed bots on chat (bot power), it was very good too. Even the security checks, I don’t use them, but it’s very useful for users to keep their accounts safe. What is the best year you spent on xat? The best year for me was 2011 for sure, I started to work on bots with 3nvisi0n‘s script and XeR‘s help. I didn’t know what I wanted to do in my life (job part) now, thanks to both of them, I code everyday and I love it! I couldn’t say what was my best memory but xat is in general is one for me. If you are talking about the general community (not English one), by the way, I would like to add something, English community thinks (or I feel it like this) they are superior to others, you are clearly not, you should visit Portuguese/Brazilian/Spanish/Hungarian chats. My answer in general is that xat is dying, and it’s NORMAL, it’s a social network with smilies. How can it be still alive along those years with Facebook, Twitter, Snapchat, Instagram… They can’t, Admin tried to develop a mobile version (it’s correct, it works), but they won’t get new users with it, they will just keep current users. I spent a lot of time on xat, I met a lot of people. But everything needs an end. Did xat ever bring you anything in real life? Of course it did, as I said in another question, I started to code because of xat with bots and stuff, I went to an university to learn, that’s my job today and I love it! You recently opened a forum thread stating you were leaving xat but you’re still here, what happened? That’s a good question, I found a job, I wanted to quit xat and focus on my job. I lose it, so I came back on xat. I have currently a new one, I don’t know yet if I will try to quit again or not. 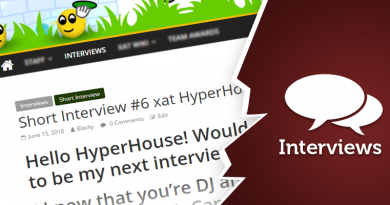 Have you already met someone from xat IRL? I never met someone, I guess it would be funny, I would love to, maybe soon. Do you have a role model? Who do you trust a lot on xat? I don’t have a role model on xat. Yet, I guess I trust a lot my closest friends. I don’t have a favourite power, in my opinion smilies powers are useless, and releasing one every week doesn’t help, it makes them disposable powers. Important powers are name/status editing powers and function powers. What is your favourite chat? Hmm, I don’t have a favourite chat, but when I’m on xat I spend most of my time on OceanProject and xat5 (I prefer forum than xat5 now). You said you like the forum, why? Since xat updated their forum, it’s more active, users are talking about issues/new powers/suggestions. It’s also a bridge between random users and vols/admins. And it’s clearly better to give your opinion than typing on chats. What is your opinion on bringing back the monthly main system on xat_test? About xat_test, I never liked this monthly main system for many reasons. First, it’s supposed to be a testing chat, since years it’s everything but not a testing chat. Second, it’s not good for a chat to have a monthly staff, and every time they took their friends as staff. Third, I don’t understand the point of doing this, is it to know if the user can manage a chat? I think not, a month is not enough. The good thing would be to give the chat to a testing team (used to be known as volunteers, but they just resell their test power for 2,5k xats). And it’s too late, xat5 is running like this since too long, people come there to get info about new power, to know about the next release… That’s why admins had to create xat2. How could you be that severe about xat_test while you have been a monthly main? I don’t think I’m severe, I’m giving my true opinion, and I’m sure some have the same opinion. If this comment can change things since Maverick just resign from his position, it’s completely worth. What’s your favourite help support? You are a listed bot provider but you also helped xat in other ways. Let’s discover the different things you did and still do for xat. How would you define your main role on xat? My main role on xat? Hmm, as I said earlier, I’m always too involved. I was added in the Contributor section, I noticed not many of the users added there had the same vision as me about xat and how should it be. It created teams between contributors, and of course it ended into a drama. Not surprisingly, I got kicked, I felt betrayed. Almost the same thing happened in wiki team. After this I decided to just focus on my bots. Will it change? No idea. How would you describe your wiki career? I remember the way I got a translator position, you were working on xat website’s translation and xat was looking for users to translate the wiki, I PC’d Mihay about it, he contacted Cyan who created my wiki account. Maybe 1 or 2 years later I got Editor, not for my English skills as you can see, but because I found another way to help editors with my generators. Apparently I don’t deserve this rank anymore. Well, I’m not an English native speaker, it’s complicated for me to write an article without grammar mistakes. The only things I can provide is translating to french, corrections, generators, templates, editing powers/hats. I would love to be able to do more. I can’t. Obvious question but have you ever code something for xat? Yeah! I coded a lot of things around xat. I created a bot hoster in 2012 with XeR, we kept his bot’s name (OceanProject). I created xatid with Emeric in 2013, you were able to buy and sell ids via the website. And others stuff but I need to keep them secret. Talking about your bot provider, how do you manage it, its chat staff, the different developers and so on? I’m now the only one to manage servers, errors, new features… XeR used to help me, but he has better things to do. About the staff, most of my customers speak Spanish, Portuguese – same for my staff, and some don’t really speak English. I’m lucky, I have a wonderful staff, they help users via the chat and ticket system. I started a github project to add more developers to help me, bot project is almost done, website project is 5% done, I really need to work again on it, but I also need to continue to add features on the current version, that’s complicate. If that’s not under privacy, how much xats do you earn each month and how much did you earn totally thanks to OceanProject? How much is that compared to other bot providers? Ahah, of course you want to know, I can share this info. I get around 100-110k per month, that’s around 250-300€ each month, it’s not a lot to be honest, but it helps me to pay my flat so it’s OK – better than nothing. In total, I’ve maybe earned around 5M xats since 2012, I spent some in IDs. Compared to others bot hosters… Fex is 1000 xats for 45 days, they have around 100 – 120 premium bot, so it’s around 1M xats profit per year. LP89 is 300 xats monthly or 2000 xats per year, they have 380 – 420 bots premium, it’s around 1,1M xats per year. Arcbot is 250 xats per month (used to be 1000 xats during 3 years then 500 xats during 6 months), I don’t know how many premium bots they have, but according to their bots list 1200 bots, so we can admit more than 800 bots are premium, that’s make more than 2M xats per year. But they used to earn a lot more! We can say LP89, Fex and I are earning the same amount per year. What’s the relationship between bot providers and xat admins? Between bot providers and admins, we are good, every time xat is doing a server update they ask us if it affects bots or not. They also provide a free power every week and that’s really cool, I used to spam powers page to buy it as soon as possible. Don’t you think this is a bit unfair having kind of bot corporations receiving free test powers for their premium bot while new developers would need to achieve EveryPower on their own before proposing a premium bot? Nope, we are running our services since years, for new developers, if there is any, it’s normal to not receive a free test power yet on their bot account. What would you say to anyone willing to start his own bot provider? To be honest it’s too late to start a bot provider, they can have the best bot/website, the most important is customers and it took me years to have my 800 running bots. So nope, it’s not possible to start a bot provider now. You didn’t talk about it yet you also were main owner on Contest (now redirected to Game), how did that happen? I used to help Ryan with donations from Admin and I. Ryan had to quit for personal issues, so he decided to give me the leadership of his chat. Contests needed donations to stay alive, I was getting xats every months with my bot, It was easy for me to provide xats. Good and bad, I was not the best choice according to the current staff, they didn’t know me, I was just their sugar daddy. The good part is I organized themed weeks with others main owners, and that was cool, I never did that before. At the end, I decided to give the chat to Chelly, and she merged with Steven’s chat. One of your project was xatid, could you explain? It was a big project, we coded it with Emeric in less than 2 weeks, we spent days and nights on it. The main thing was to provide security for an ID transaction. 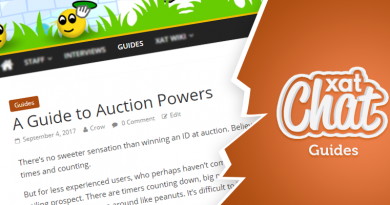 Users were able to buy and sell IDs on the website. I didn’t have the choice actually, there were 2 issues. A user was able to buy an id with stolen xats and the id kept server’s IP during registration. It was not secured anymore. I had to close it. I tried to re-open it two times, without luck, I needed volunteers to check xats and a new k2 for every IDs without re-register and delete it to be 100% sure I could send the register link via email instead of doing it from my server. Do you have any last word to conclude this interview? Thanks for this interview, it was a way for me to list everything I made for this website and the community. It forced me to think to all those old moments. It makes me feel proud. Thanks to xat and their community for everything they gave to me during 7 years. Don’t take this interview as a pessimist view. I’m very happy, if I had to, I would do it again. In fact I enjoyed reading this interview with JEDI, … it elucidated me on several issues that made me confused.